High performance with low power consumption and operating cost make the LUMATEK 250W a great ballast for beginner and professional growers of light-sensitive crops. A ballast is necessary to light high intensity discharge (HID) lamps such as high pressure sodium (HPS) and metal halide (MH) grow lamps. Depending on the type of crop and light cycle required, ballasts run continuously 8 – 24 hours a day and must therefore be as efficient as possible. With less energy wasted as by-product heat Lumatek ballasts create more light from less energy consumed. Conventional core & coil magnetic ballasts waste a large proportion of the energy consumed as by-product heat, can experience a reduction in performance over time and can even catch fire through extended use. 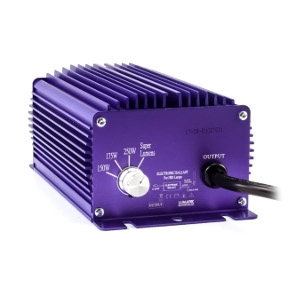 Lumatek digital ballasts control start phases and voltage output via microprocessors which improve lamp performance and less energy is wasted as heat. Even in long term operation the Lumatek 250W will only become lukewarm and has full circuit protection including open/short circuit, over temperature, over/low voltage, end of lamp life/rectification and EMI suppression.